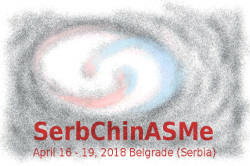 In order to start the collaboration between Serbian and Chinese astronomers, we are going to organize astronomical meeting, that is primarily initiated by two groups (from Astronomical Observatory in Belgrade, and Key Laboratory for Particle Astrophysics, Institute of High Energy Physics, Chinese Academy of Sciences in Beijing) which are involved in investigation of the physic and nature of Active Galactic Nuclei (AGNs). The meeting will have six to eight review lectures about research in this field and investigation which have been performed by these two groups. Additionally, we expect to have several short talks with specific subjects. Moreover, the meeting is open to entire astronomical society which are dealing with the AGNs and familiar subjects, especially to the astronomers from Serbia and China. During the meeting we are going to have 'open discussion' about possible collaboration in the theoretical and observational astronomy.